Magento Marketplace Web Services API : This multi vendor marketplace addon will expose the Web Services API of Marketplace module with SOAP/XML - RPC api so that marketplace functions can be used by other application like ERP, Mobile application ( iOS , Windows, etc). Magento Marketplace Web Services API - This multi vendor marketplace addon will expose the Web Services API of Marketplace module with SOAP/XML - RPC api so that marketplace functions can be used by other application like ERP, Mobile application ( iOS , Windows, etc). Standard SOAP api support found. JSON format return can be used in mobile and ERP devices including OPENERP . we have built world best openerp magento connector. 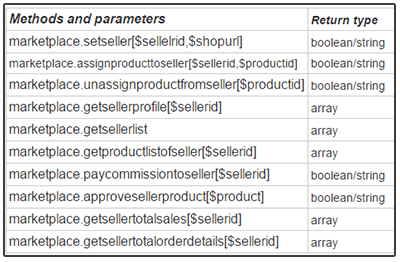 Extend all magento marketplace functions including marketplace , sellers-list , assign seller. Easy to customise the module . Using this module addon Marketplace managed from another applications easily. By the help of Magento Marketplace Web Services API, you can call the functions of the marketplace from any third party platform like ERP, Mobile application ( iOS , Windows, etc) and the process will be executed and return results as per the execution process. When this module will be installed, then the listed functions in the Magento Marketplace Web Services API of Marketplace module will be exposed and you call those APIs from any third party using your Magento SOAP user's credentials. Following Functions can be exposed by this module (Magento Marketplace Web Services API). Did you buy Magento Marketplace Web Services API?